Stand out from the crowd! Get noticed over your competition on the 2019 Fergus Falls Chamber map. A new, full-color printed map of Fergus Falls and Otter Tail County is in production. We are partnering with The Daily Journal to print and deliver 25,000 high-quality, glossy, full-color maps, which will be updated to reflect our growth and showcase our beautiful community. This map is a great tool to communicate information about your business to new residents, other businesses and visitors. This year, The Daily Journal will deliver 20,000 maps throughout the region with The Resorter and the Chamber will distribute 5,000 maps to our 13 area visitor kiosks and in response to in-person, phone and email inquiries. It’s one of the main printed publications that are included in each relocation packet we mail. As a map sponsor, your business/organization will be positioned as a community leader and a community supporter and you will reach more than 30,000 individuals through low-cost-per-view advertising (business card-sized ads start at $495). 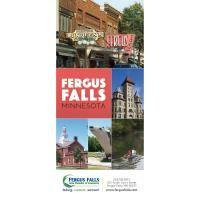 Sponsoring the map is an exclusive offer, available only to members of the Fergus Falls Area Chamber of Commerce. The map is considered the "official" full-color folded, glossy map of Fergus Falls as we partner with the GIS Dept. of the City of Fergus Falls to insure its accuracy. To find out more about this project, or to schedule a personal appointment, please contact Jim Sturgeon at The Daily Journal (218-739-7011 or 218-205-0795). You can also contact the Chamber directly at 218-736-6951 with questions or concerns.